Hello, friends! I hope your new year is going great so far. I personally am vowing to stay more focused this year. I recently shared my focused goals for 2014 here. 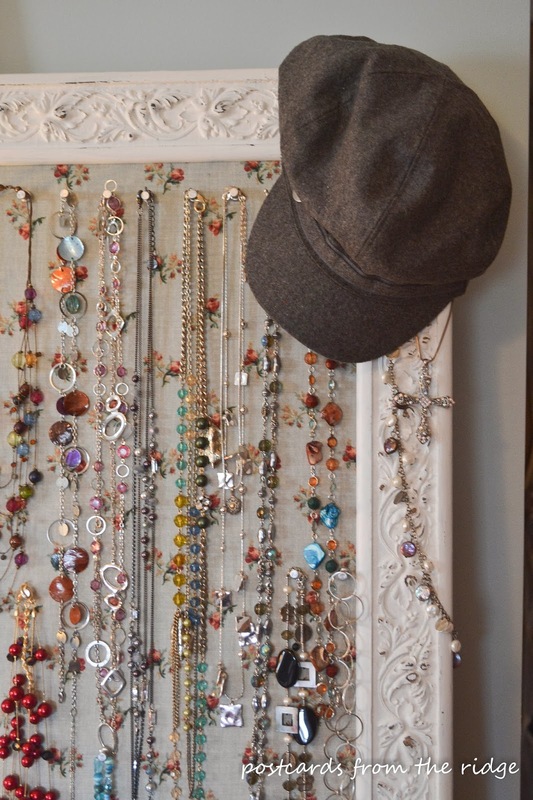 Over the weekend, my focus was doing some organization in our bedroom, specifically my jewelry. I seem to have an addiction to the inexpensive variety. But, a girl has to have a little bling, right? Right. And I get my jewelry from Target, Kohl's, Belk, TJ Maxx, etc., so it's ok to have lots of it. Sorry to disappoint any potential theives, but mine wouldn't be worth stealing. 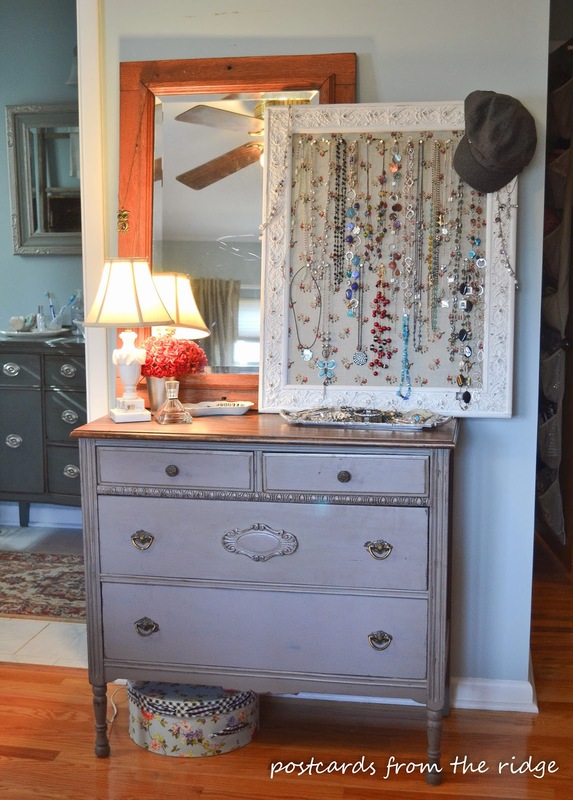 If you've read this blog before, then you know that I love to repurpose vintage items whenever possible. And I really like to think outside of the box when my mind allows it! 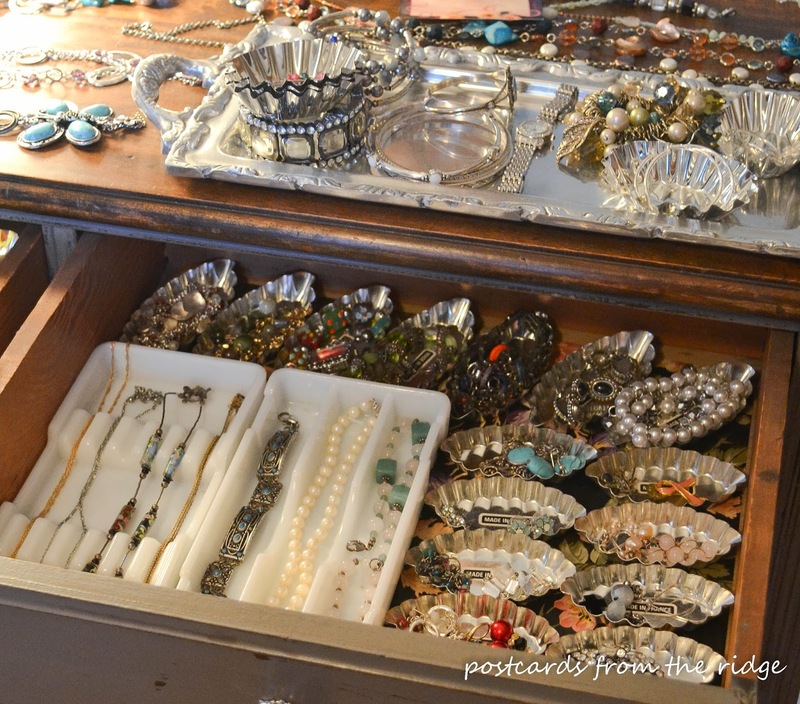 For this jewelry organizing project, I used several vintage items for something other than their intended use. I think you might like it! For the record, I already had all of the items used for this project on hand, just waiting to be used or repurposed. I found these little tart tins at a yard sale last spring and snatched them up. They were made in France, so that made them that much better. :) There were about 30 of them, and I knew that they would come in handy either for organization or something crafty. Since I'm not very crafty, they worked out perfectly for this organizing project. Other than yard sales, they're also pretty cheap here. As in, 35 cents each. The milk glass dental trays came from our local Goodwill store. 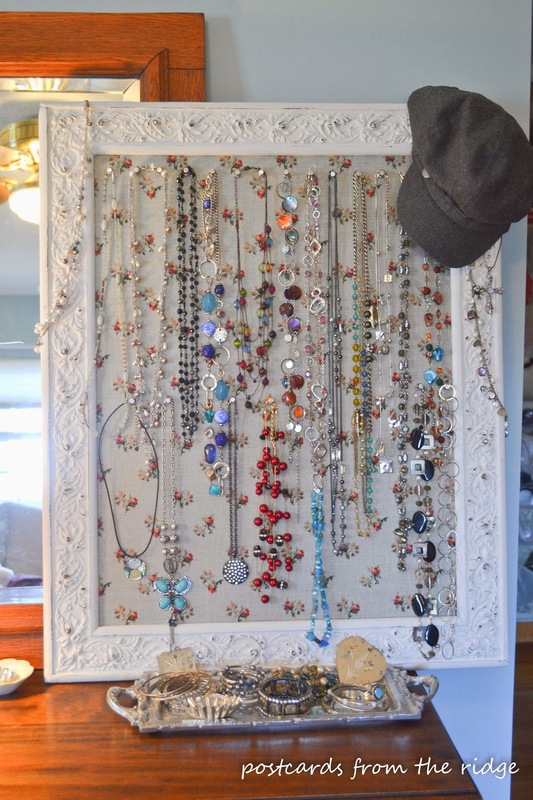 I had seen something online where someone had used some of them for jewelry storage and knew that I could use them for that. 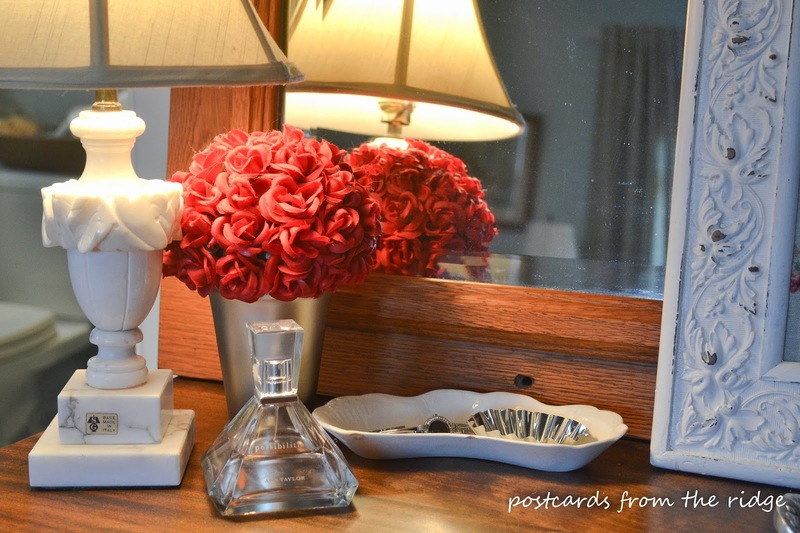 And I already have an addiction to milk glass anyway. So they came home with me. 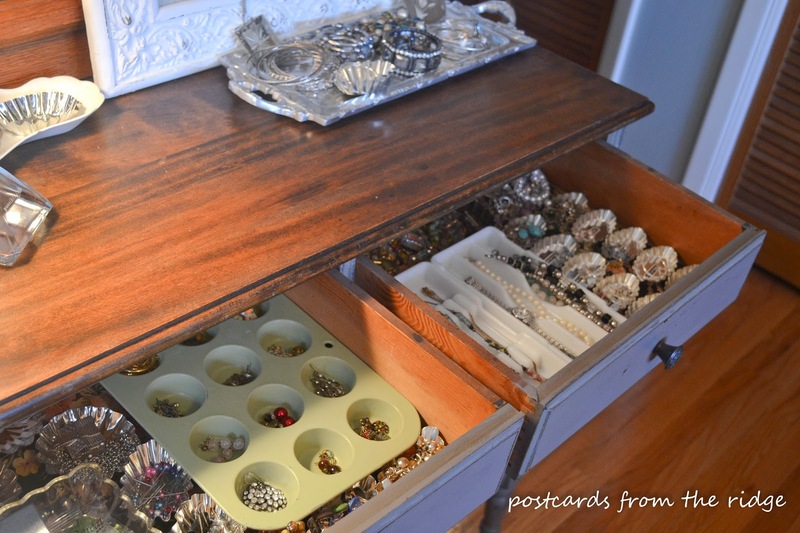 For this jewelry organizing project, I also used some mini muffin pans that came from Goodwill. I have 2 more of these in my desk drawers at work, holding paper clips, thumbtacks, and other small office supplies. They're so handy! Even if they aren't as pretty as the shiny little tins. 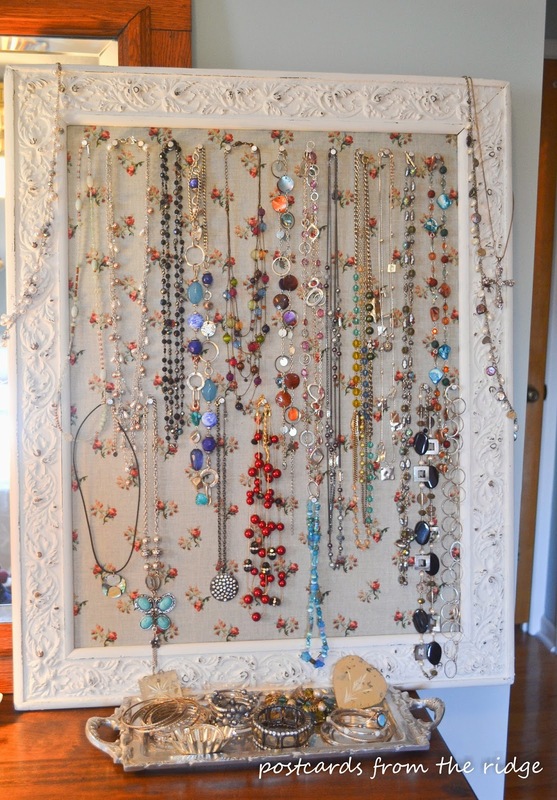 For my longer necklaces, which is my true addiction, I used an old frame that I picked up at the Nashville flea market years ago. When I bought it, it was beat up, dirty, and a couple of the corners looked like they had been chewed on by a dog. My husband thought I was crazy for actually paying for it. But after some wood filler and paint, it was ready to become a bulletin board. I found the little candy/nut dish at the thrift store a couple of months ago for $1 and it's perfect for my watch and other things that I wear almost daily. It's crackled old ironstone and I adore it. I originally painted the frame black and didn't cover the board with fabric, but part of this current project involved repainting the frame off white with leftover paint from our bathroom renovation, and also covering the board with a scrap of fabric I've had forever. Can someone say "hoarder"? Seriously, though, I buy things that I really like knowing that I will find a use for them....eventually. And I usually do. I'll post the how-to for the frame soon. In the meantime, here's a post of a similar one I made for our oldest daughter. It's the same concept. And it's one of my very first posts, so try not to judge too much! I hung my new hat on the corner of the bulletin board just for fun. I bought it a couple of weeks ago and I just love it, even though my girls tell me I look like a newspaper boy when I wear it with my hair tucked into it. It's great for bad hair days. The tray came from an estate sale. It's lightweight and is perfect for my bangle bracelets. 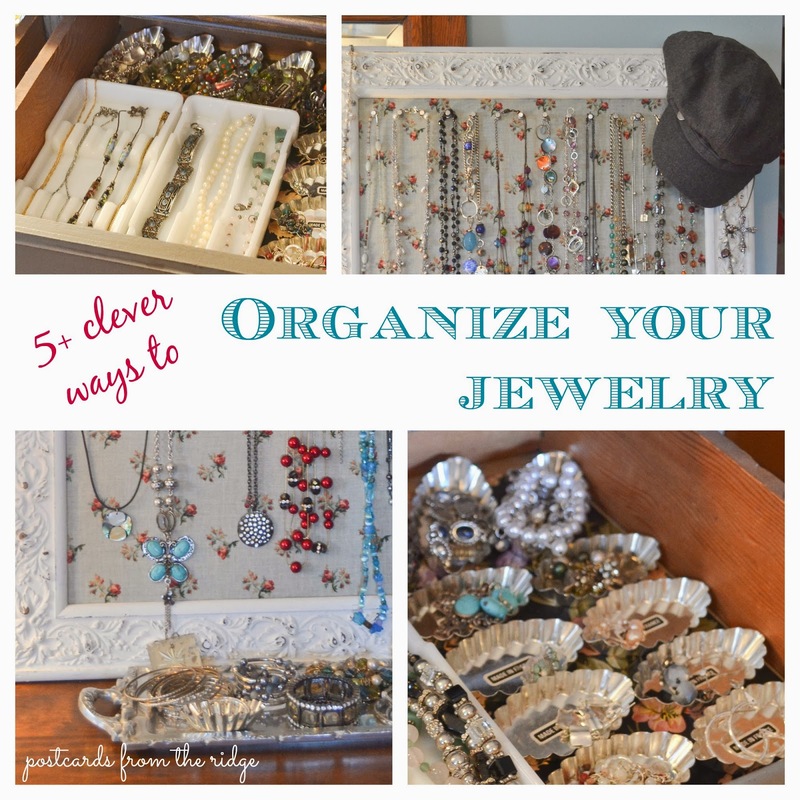 I've got more ideas for jewelry organization, as well as orgainization for the entire house on my pinterest board titled "Let's get organized". Check it out for some great ideas. 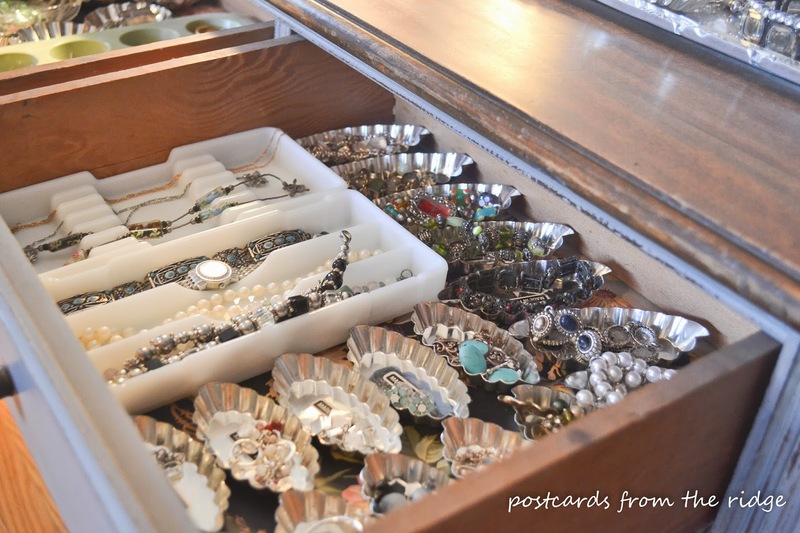 I'm sure there are many other creative ways to store and display your jewelry. What are some ways that you store yours? I'd love to hear your ideas. 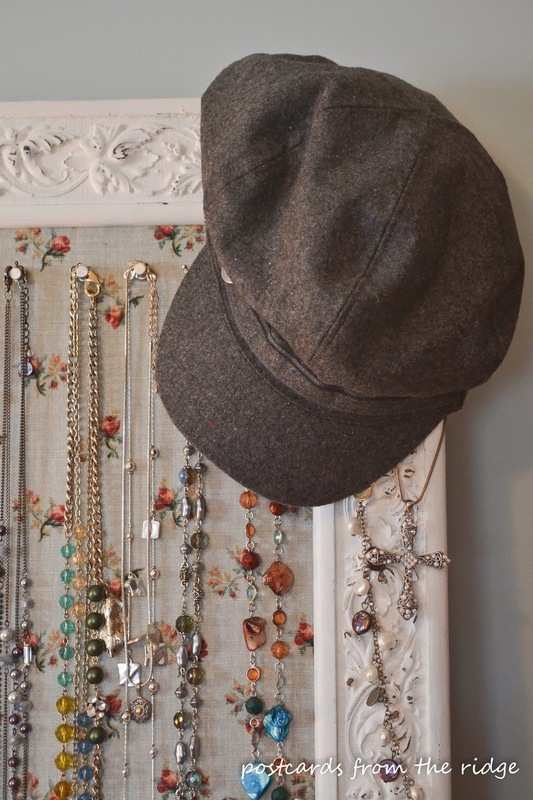 Great jewelry organizing ideas, Angie. I love those little tart pans, and hanging your necklaces sure beats trying to untangle them when they're heaped together in a drawer. 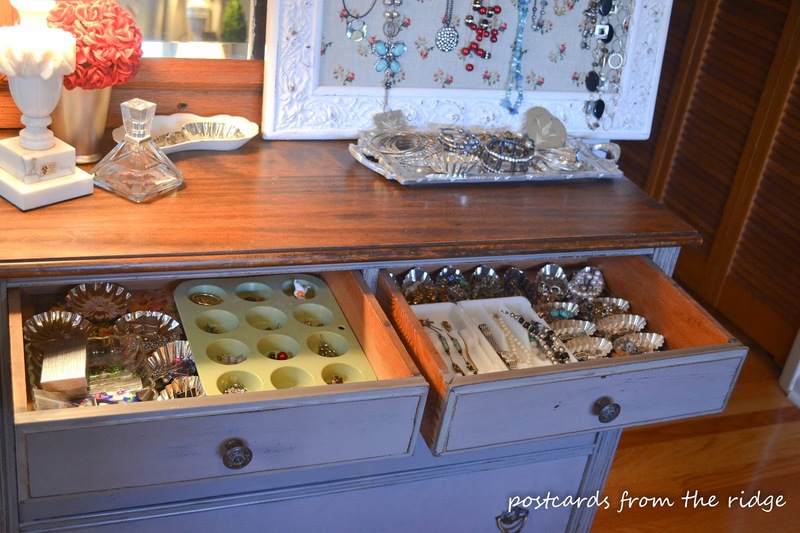 Oh, I like all your jewelry organizers. I love jewelry and it is sometimes hard to keep all straight and accessible. I will be on the lookout for those tart tins - I love that. 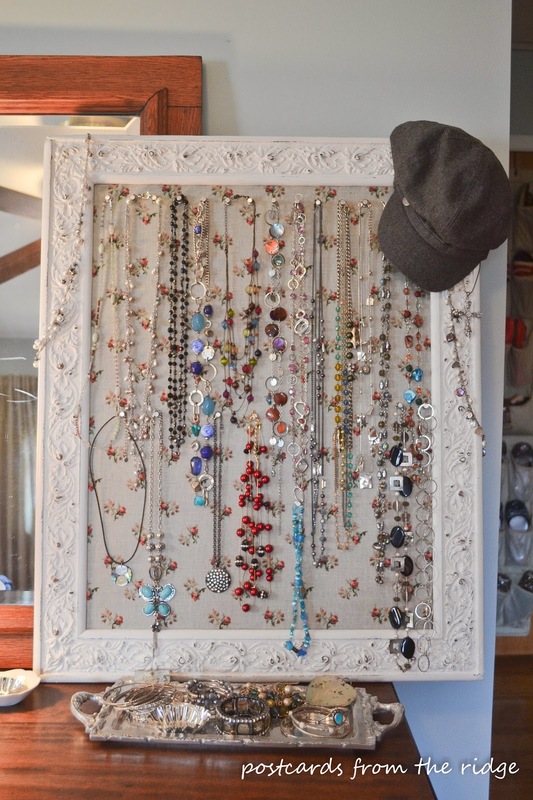 A friend uses a pegboard on which to hang her necklaces in her closet. Sounds like a great idea to me, if not pretty!